The style and design of Bar Mitzvah dresses and Bat Mitzvah dresses can vary greatly and is typically determined by the formality of the celebration. Depending upon the type of ceremony, you may need a formal dress, semi-formal dress, or casual party dress. Whether you are attending a friend’s ceremony or are the guest of honor, browse this collection of short dresses for Bar/Bat Mitzvahs. Here you’ll find stunning Bar/Bat Mitzvah dresses from top designers, Sherri Hill, Jovani, Alyce Paris, Dave and Johnny, and many more. These designer dresses for Bar Mitzvahs blend fashion-forward stylings with classic cuts and designs to create contemporary party dresses, sure to please. 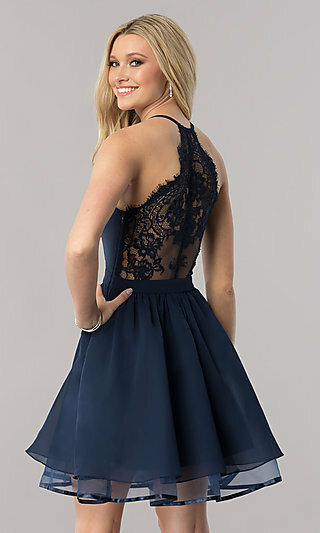 Whether you need a modest semi-formal dress for the service, or a short chic cocktail party dress for the celebration, you’ll find plenty of unique options to choose from at Simply Dresses. What is Appropriate to Wear to a Bar/Bat Mitzvah? 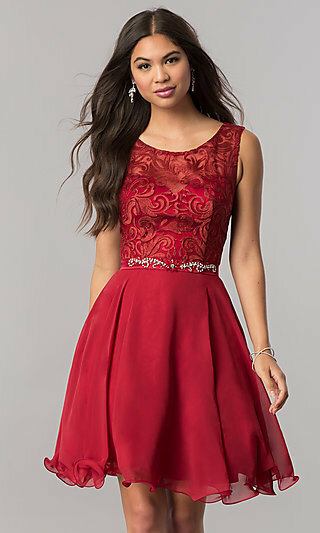 Explore this section of Bar/Bat Mitzvah dresses for designer party dresses for guests as well as the honoree. Typically, formal dresses are worn to the reading ceremony and semi-formal party dresses are reserved for the celebration afterwards. Although, choosing the proper special occasion dress will depend upon the type of celebration, the variety of styles offered in this collection ensures you’ll find a Bar Mitzvah dress with ease at Simply Dresses. Simply, slip into the elegance of a knee-length or tea-length chiffon print dress for the modest, yet chic look. Try a dazzling short cocktail party dress for just the right amount of sparkle at the party. For an innocent youthful vibe, try one of the twirl-ready short party dresses with layered tulle skirts and jewel embellished bodices. Still not sure what you should wear? Remember the timelessly classic little black dress is a great look for any occasion. In this assortment of Bar/Bat Mitzvah dresses, you can choose from several lbds that merge classic cuts, trendy accents, and contemporary designs. Although commonly used to refer to the celebration, Bar Mitzvah or Bat Mitzvah is actually the term for the guest of honor, and translates to, “son or daughter of the commandment.” For months prior to their 13th birthday, Jewish youth study the Torah, preparing to read a passage aloud in front of their friends and family at the ceremony. This important religious ceremony signifies the Bar/Bat Mitzvah’s journey to fulfill their obligations to observe the commandments of Judaism. Once the ceremony is complete, the Bar/Bat Mitzvah are then viewed as active members of the religious community and become responsible for their own actions. After the Shabbat service a light meal, or kiddush, may be served, and the accomplishment culminates with a celebration later that evening. A Bar/Bat Mitzvah celebration is a very important achievement and choosing an appropriate Bar or Bat Mitzvah dress is equally as important. Be sure to look and feel your best in one of these dresses for Bar/Bat Mitzvah celebrations. In keeping with traditional customs, the Bar/Bat Mitzvah, or guest of honor usually selects and sets the tone for the celebration. Since the theme and formality of the party is completely up to the Bar Mitzvah, it can literally encompass anything, including lively parties with karaoke, fun-themed events with party games and photo booths, or ultra-classic formal sit-down dinners. If you want to portray a youthful girly look, slip into one of the short dresses with illusion lace bodices and tulle skirts. Perhaps you’d prefer to channel your new mature self with a classic a-line short party dress featuring an open back or alluring cut outs. Whatever your personal style, be sure you’re ready to celebrate this enormous achievement and party like a pro in one of these designer Bar and Bat Mitzvah dresses.